So that’s how it’s done. I’ve been crocheting up dishcloths that I intend to give away as gifts along with the ruffle scarves that I loved spending time working up. Sharing another crochet diva’s project. Crochet class tonight, or as I like to call it “Yarn Therapy”. 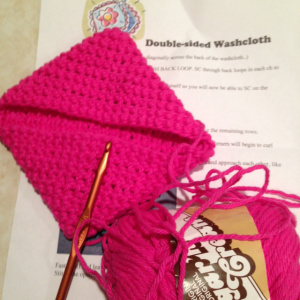 This semester’s theme is “Stash busters”, and tonight we worked on what seemed like a simple project–a double-sided washcloth. The neat thing about this pattern is you crochet simple single crochets, black loop, but you do it in an oval, and the ends bend around to eventually meet in the middle forming a square which gets sewn together with one seam. I still have another round to hook before it is done, but I really like the technique. You could also make a larger one with some batting in it to make a hot pad. Sorry for the bad photo, but it is night and I have no natural light, everything looks a bit harsh, but this shows the way it wraps around on itself.